AVerMedia C039 USB Dummy IR Receiver is a USB Universal Serial Bus device. The developer of this driver was AVerMedia TECHNOLOGIES, Inc.. The hardware id of this driver is USB/VID_07CA&PID_C039&MI_00. 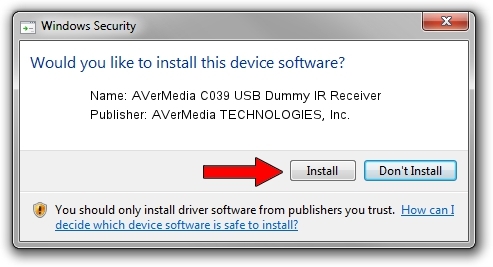 Download the setup file for AVerMedia TECHNOLOGIES, Inc. AVerMedia C039 USB Dummy IR Receiver driver from the location below. This download link is for the driver version 10.2.0.103 dated 2013-12-18. Go through the driver setup wizard, which should be pretty easy to follow. The driver setup wizard will scan your PC for compatible devices and will install the driver. This driver was rated with an average of 4.1 stars by 83899 users. Take a look at the list of available driver updates. Search the list until you locate the AVerMedia TECHNOLOGIES, Inc. AVerMedia C039 USB Dummy IR Receiver driver. Click on Update.